That is the name granted to be by my human masters. This book was sent for me to review by the publisher. Let me just start by saying that this book is genius. Really, that’s all you have to know. It’s absolutely, pure genius. In fact, this one is so good I have no idea just how I’m going to articulate all of the awesome. This review is going to be a bumbling mess, and I apologize for that, but really, this book is genius. That’s my review. Feel free to stop reading now. I am a huge fan of Ian Tregillis, which isn’t really news to anyone. I absolutely loved the Milkweed Triptych, which established Tregillis as a new, bold, brave voice in the genre. No one can really take alternative history and warp it quite like Tregillis. His characters are never safe. His books are visceral, emotional, and often (deliciously) uncomfortable and shocking. His writing is strong and powerful. Oh, I could go on, but I think I’ve given you guys the general idea of why he is such an incredibly badass author. I have yet to read a book by this author that I haven’t absolutely loved, and The Mechanical is no different. In fact, in some ways I think this book might be the crowning achievement of Tregillis’s career thus far. The Mechanical is something completely different than anything Tregillis has written before. This is another alternative history twisted as on Tregillis can twist things. The Netherlands is the world’s superpower. France is trying to make one last stand in the North America. The world is, at once, the same and very, very different than anything we’re familiar with. The political tension is incredibly high, everyone is out for everyone else, and the world building is…. wow. Half the battle with books that are political and full of alternative history managing to keep the political machinations, inevitably incredibly important, from overshadowing the actual world building. The world is absolutely stunning, some of the best world building I’ve run across in a novel in a while. The science is superb, and plays an important role in much of the events, and the philosophy that is developed for the plot. Religion isn’t overlooked, either and oh, the magic. Back in the 17th century some scientists used magic to created clakkers and used a geasa to bind them to the rulers of he Calvinist Dutch Empire. These clakkers, machines, for lack of a better word, add a little steampunk flair to the novel. However, Tregillis, through Jax, really gives their plight some interesting and heartfelt perspective. And that’s where things get pretty interesting. The Mechanical is a pretty amazing book, and I’m not really sure how to say why it is as amazing as it is because there is just so much to say. Aside from the intricate world building, the tense politics, and the plot that never really stops surprising me, this novel is full of philosophy and heart felt struggles that will really pull readers in. Added to this is a fascinating class and social battle regarding the Clakkers, and their desire to break the geasa and become their own people. This toys with complex topics like free will and equality, and you really have an interesting soup that only Tregillis seems capable of throwing together this deftly. I really enjoy books that deal with themes involving the human condition, and ask readers what makes us worthy of equal rights and fair treatment, and Tregillis pulls out all the stops. Coupled with the politics, the religion, the world building, the way that Tregillis handles complex topics and philosophies in this one is nothing short of mind boggling. While this is incredibly different from other books that Tregillis has written, it has some of the same qualities. The writing is absolutely stunning. Tregillis also has a nothing-is-sacred vibe with his books. No character is out of bounds for his torment, or tragedy. I really appreciate that. Tregillis keeps his readers guessing and unsure. The surprises can be heart stopping, and really ramp up the emotions. The book is evocative, and dark, visceral and real. 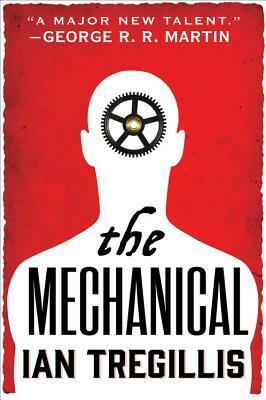 The Mechanical is a book I can’t stop thinking about, and I’m thrilled that it’s the first book in a series. This is one of those rare reads that is incredibly hard to review. How in the world am I supposed to tell people how incredible a book is if I can’t even figure out how to put it into words? This is a trans-oceanic, political, intricate, detailed, philosophical start to a series that is going to blow me away. More, Tregillis! I want more! !